Often a Windows user nightmare is finding right drivers for his hardware which fails to get detected or you lost your drivers CD or you can not find drivers for a different version of operating system. In the past we have talked about many tools like Unknown device Identifier which can help you detect and find drivers for known components. Today we will talk about a browser add-on Ma-config which does a excellent job of detecting and finding drivers for all your hardware. My-Config.com is an invaluable but free service for PC users running WindowsÂ® operating systems. It is compatible with the main browsers (M.S.I.E., FireFoxÂ®, OperaÂ®, ChromeÂ® V2, SafariÂ®). 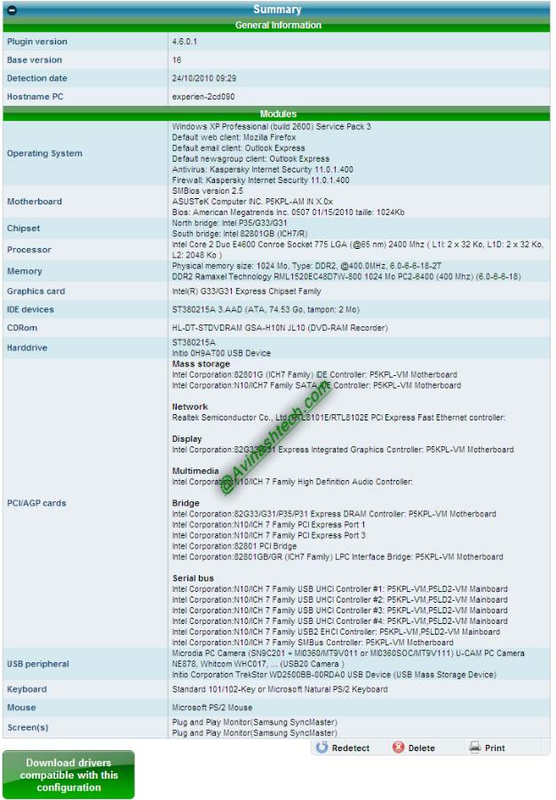 After installation of a plugin (certified by VeriSignÂ®), the user has possibility to set himself the detection level (depth) of the hardware and software components of a PC. This site works in partnership with TousLesDrivers.com. 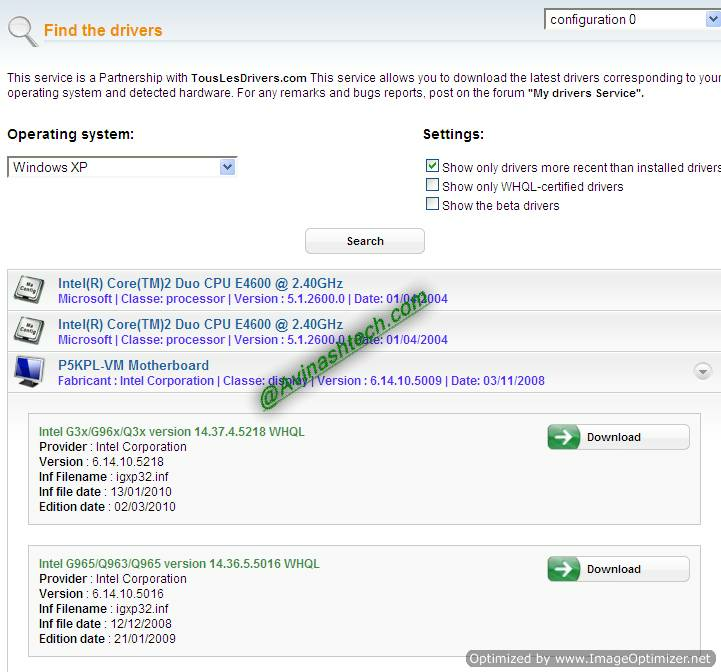 You can easily identify and install the drivers that correspond to your configuration. You just need to install a activeX addon and then run the detection. The tool starts detecting your hardware online quite fast. After this is finished, it will show you a whole lot of information about your hardware. You will be amazed at the data it provides about your system. Just have a look at info it gave about my Desktop. 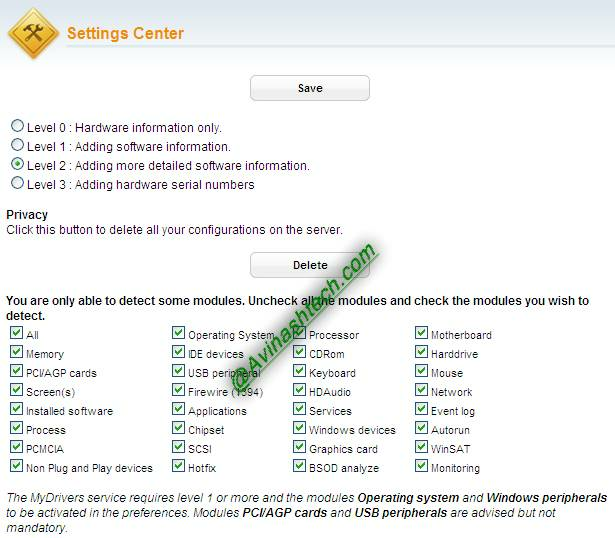 With all this information, you get the option to download drivers compatible with your configuration. Just click the button and on next page, you will get the list of drivers available for download. Here too, the list is quite extensive. You can also select a different operating system and see if the drivers are available for your hardware for that particular system. Apart from this, you can configure the settings on what kind of information you want. You can set it to just hardware or both hardware and software info. If you want, you can get detailed information about the software installed along with hardware serial numbers. Another feature you may love is, you can download a detailed report of your system. I was just amazed at the amount of info this report got about my system. The detailed report of my Desktop system was a whopping 300+ pages. Yes, you read that right, the PDF report was more than 300 pages. PS: The website may not be fully in English language, but don’t get deterred by it. And Thanks Ha14 for telling about this. A nice article, hope that you are enjoying reading 300+page report, in fact for a general knowledge is an interesting feature. If safe mode is working, try restoring your system to previous state using the System Restore option.